Team Alvimedica won the final offshore battle, claiming the final leg nine of the Volvo Ocean Race, into Gothenberg, but overall glory belonged to overall race winning Abu Dhabi Ocean Racing. After painfully slow final miles into the Gothenburg finishing line, the Turkish/American Team Alvimedica, skippered by Charlie Enright, led the tightly packed fleet home to crowded docks in Volvo's Swedish heartland, bringing to a close the 38,739 miles and nine months of some of the closest racing ever witnessed in the 41-year-old round the world marathon. Team Alvimedica is the sixth team to claim honours in nine legs, testament to the new generation of one-design Volvo Ocean 65s. Team Alvimedica led the 1,000nm stage, almost from the start last Tuesday in Lorient, France, but its lead was never secure, despite entering the halfway stage in The Hague last Friday with a 91-minute lead over Dongfeng Race Team. Lighter breezes and a warm front crossing the fleet last night compressed the fleet following its departure from the Dutch 24 hour pitstop on Saturday. Dongfeng Race Team was forced to relinquish its hoped-for second place in the leg to Team Brunel, whose finish secured the runner-up spot in the overall standings. Despite not being able to hold off Spanish challengers, MAPFRE, for third position either, Charles Caudrelier’s crew still took the final podium place for third overall. 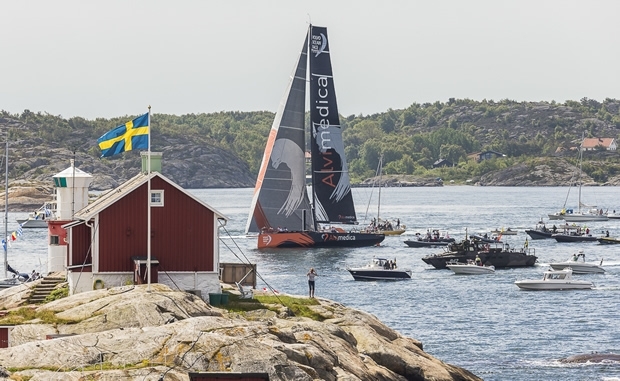 Fourth place overall, though, will have to be decided in the final play of the 2014-15 event, during Saturday's Inmarsat In-Port Race Gothenburg, when Team Alvimedica and MAPFRE, tied on 34 points, the result from which will break their tie. Overall victors, Abu Dhabi Ocean Racing, came home fifth ahead of Team Vestas Wind, with Team SCA bringing up the rear. 7 Team Vestas Wind (DEN) 60.